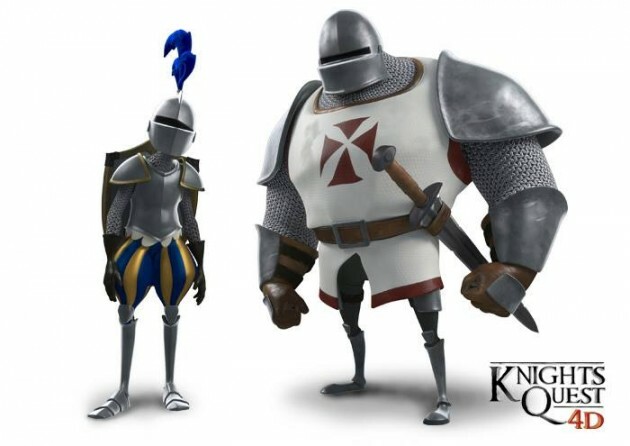 Brussels, Belgium and Sheffield, UK (October 07, 2014) /PRNewswire/ — nWave Pictures Distribution is pleased to announce the premiere of its newest 4D/3D attraction film “Knights Quest 4D” at the IAAPA Attractions Expo in Orlando (FL), November 18-21. Distributed exclusively by nWave, the 12-minute experience is available in 4D and 3D to theme parks and attraction exhibitors worldwide. IAAPA attendees will be invited to view the premiere of the film during the IAAPA Trade Show at nWave’s Booth #4836, which will have a specially designed 3D screening facility programed with spectacular 4D special effects. Directed by James Rodgers and produced by British animation studio Red Star 3D, the film features two medieval knights, each on a quest to be the hero who frees a princess from captivity. Battling against ingenious but deadly traps and puzzles, the knights try every trick to out-run each other, using increasingly desperate maneuvers. But when they discover the castle fortress holds a sinister secret, the two realize that to succeed, they must work together against a common enemy. IAAPA Attractions Expo is the largest international tradeshow for the global amusement industry, with more than 27,000 attractions professionals attending from around the world. “The medieval theme is always popular and, together with nWave, we were very excited to explore this classic theme with a modern twist. Our two heroes, strong and silent knights, are complete opposites in every way, but they end up working together to save their lives.” explained Ben Smith, Red Star’s creative director.